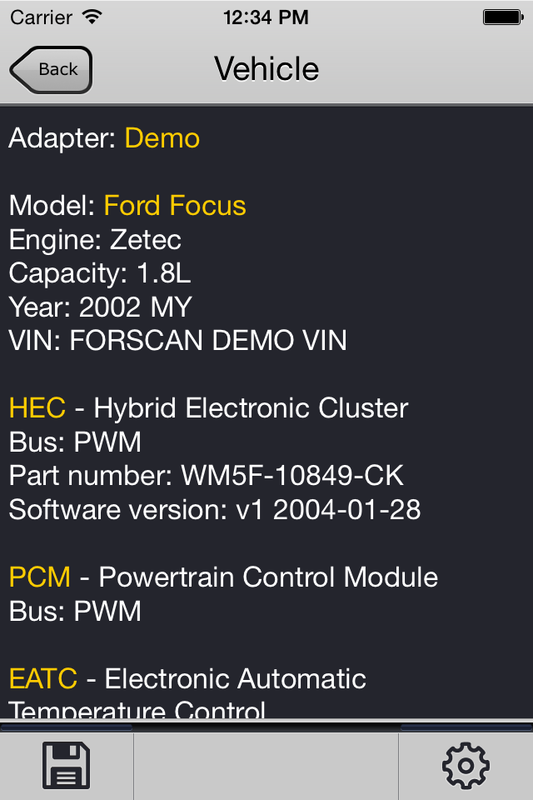 This version of manual is actual for FORScan Lite for iOS version 1.4.* . Current version of the application supports only WiFi ELM327-compatible adapters and also Kiwi 3 Bluetooth Low Energy (BLE) adapter. ELM327-compatible adapters with Bluetooth interface designed for Bluetooth SPP profile that is not supported in Apple iOS yet. All screenshots are provided in Portrait mode for iPhone and Landscape mode for iPad, but Landscape/Portrait modes are supported as well. 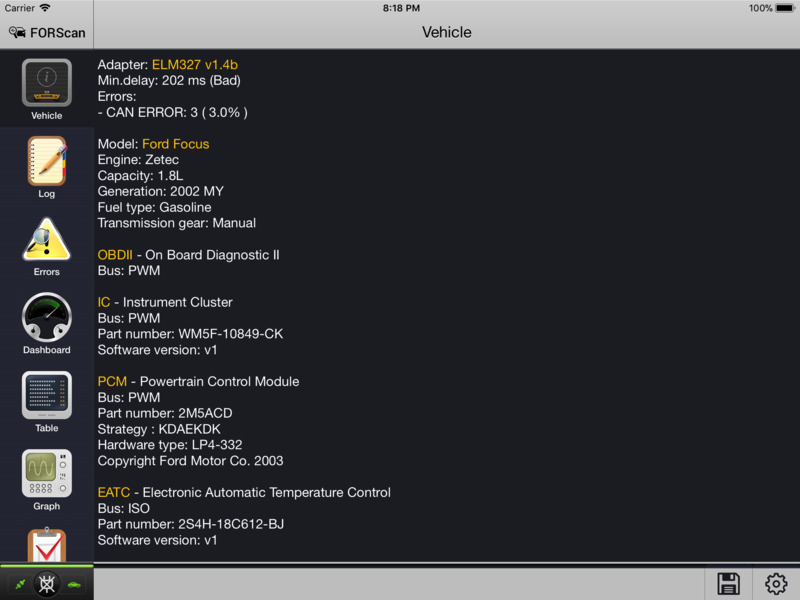 Although iPhone and iPad versions of the application have some layout differencies, functionality and logc are almost identical. So this manual will provide only iPhone screenshots. 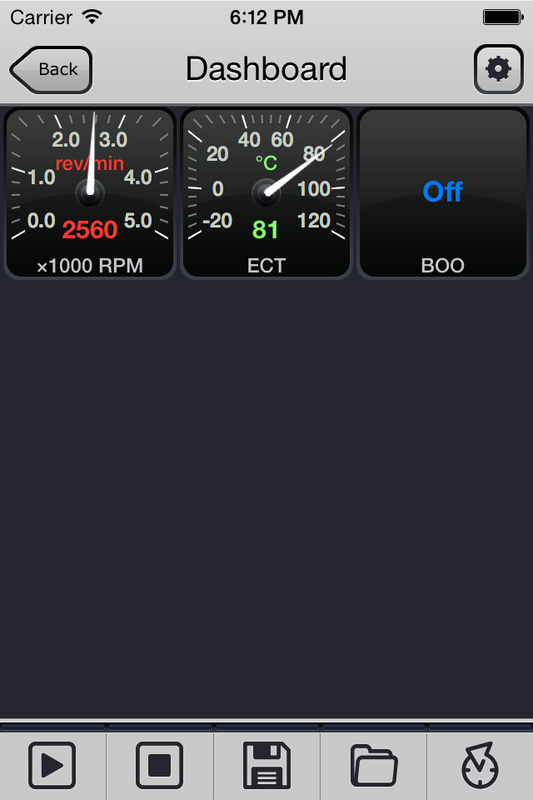 iPad screenshots will be provided only to desribe parts that are different for iPhone and iPad. 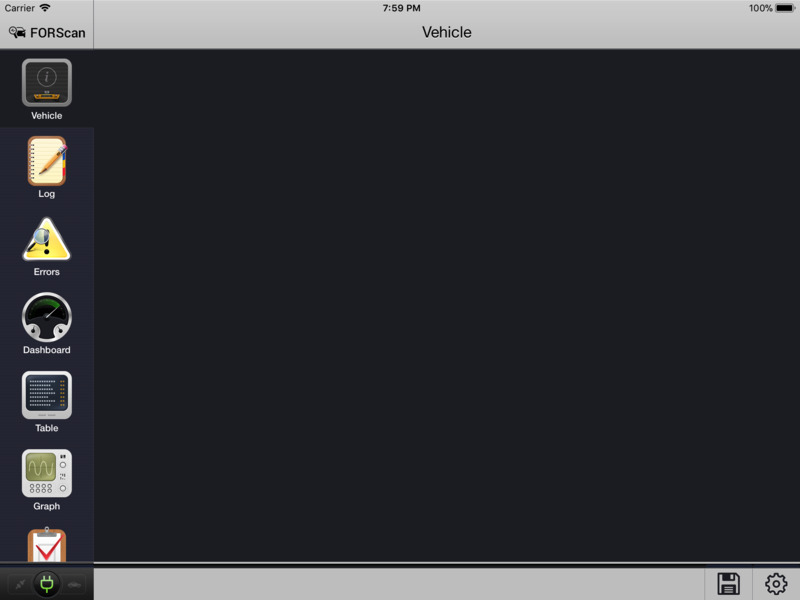 If the application is connected to the vehicle, the iOS device will not switch to the sleep (idle) mode - display will be always bright etc. It means high energy consumption. However, the mobile device can be switched to the idle mode by pressing standard Off button on the top of it. When the application is disconnected from the adapter, the device returns back to normal mode of work. FORScan tries to manage connection to the adapter seamlessly. It means, when user switches to an another application, FORScan closes connection to the adapter, and when user switches back, it restores the connection. It means that during the time between the disconnect and connect FORScan doesn't communicate with the adapter. Although in majority of cases it works perfectly, in some cases WiFi adapter may get lost (for example, switch to power saving mode if the idle time was too long). User can move up and down through hierarchy of screens. Navigation down is performed by tapping on a button, list/menu item and so on. Navigation up is performed using buttons in the navigation bar. As you may see, all indicators are gray. When connect button is pressed, FORScan Lite tries to establish a connection to an adapter, then to the vehicle. If connection is successful, the indicator becomes green. Otherwise, it becomes red. 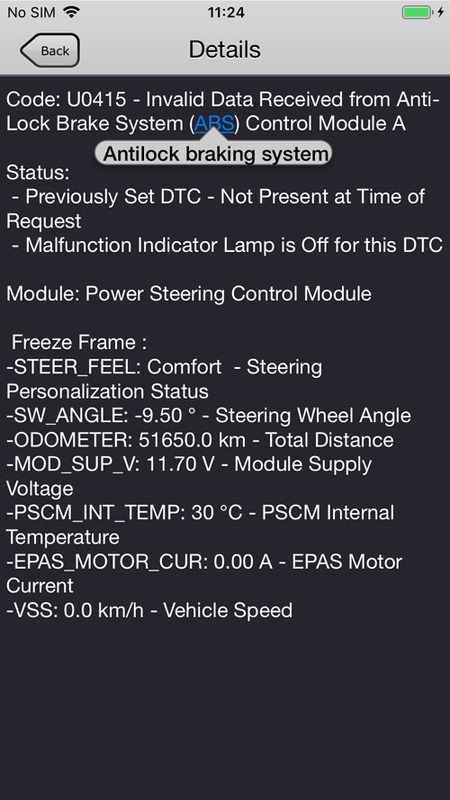 For example, if FORScan Lite was able to connect to an adapter, but not able to connect to vehicle, the interface indicator will be green and vehicle indicator will be red. 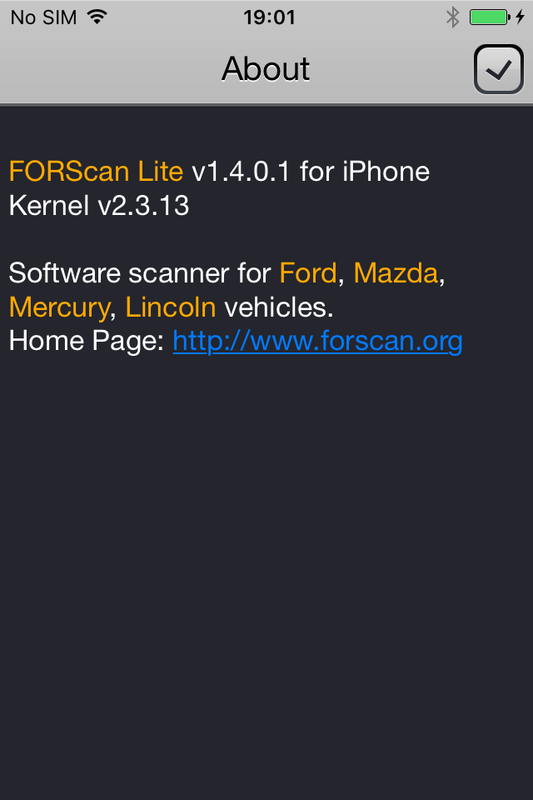 Most important information on this page is version of the kernel that is displayed right after the version of FORScan Lite for iOS. All versions of FORScan use the same kernel, so this version number is in sync with the one displayed on FORScan Web site everywhere (announcements, Change history etc). Another difference is that iPad version has About section available from the main (left) menu. 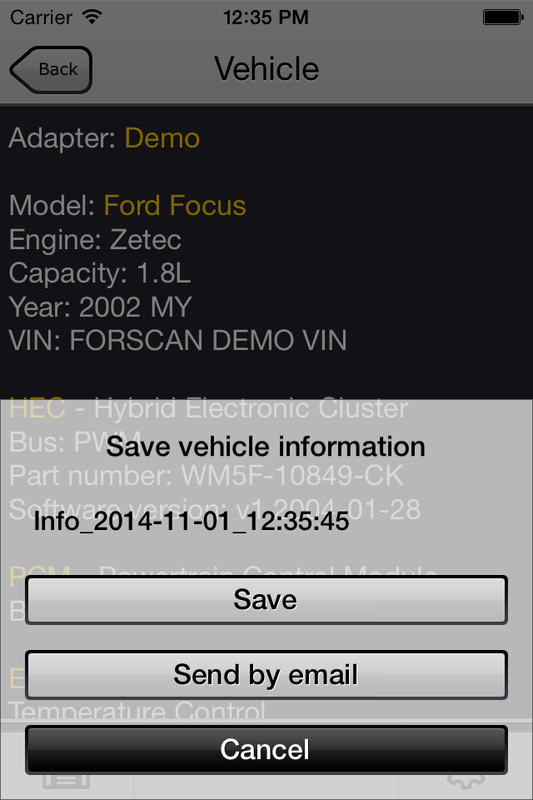 Demo mode - special mode to demonstrate application abilities even without connect to an adapter and vehicle. Initially, when application is installed, the Demo mode is on. But every time when user tries to connect, FORScan offers to switch from Demo to Real mode. If users agrees, the demo mode is disabled and normal connection to adapter is performed. Demo mode can be turned on any time using this option. Connection type - user can select one of 3 connection types: Auto, WiFi and BLE Kiwi. Auto option is enabled by default. This type assumes that FORScan first tries to find Kiwi 3 and if not succesful, it continues with WiFi one. 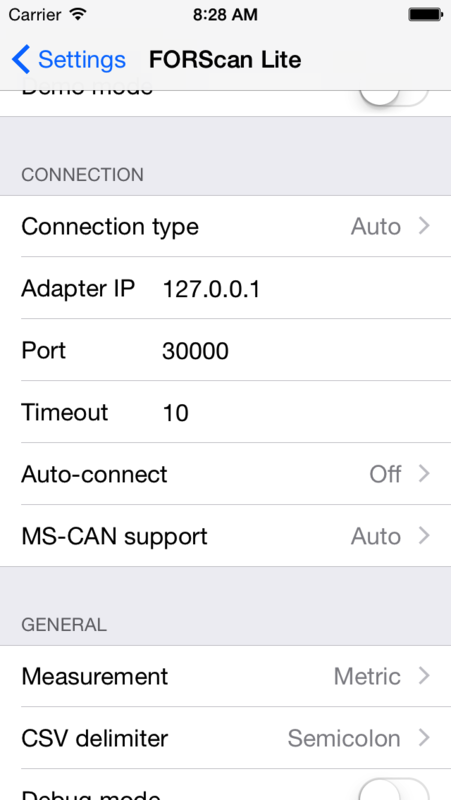 IP, Port, Timeout - WiFi specific settings. Auto-connect - forces automated connect right after the application's start. By default it is Off. If it is set to On, only connect is performed. 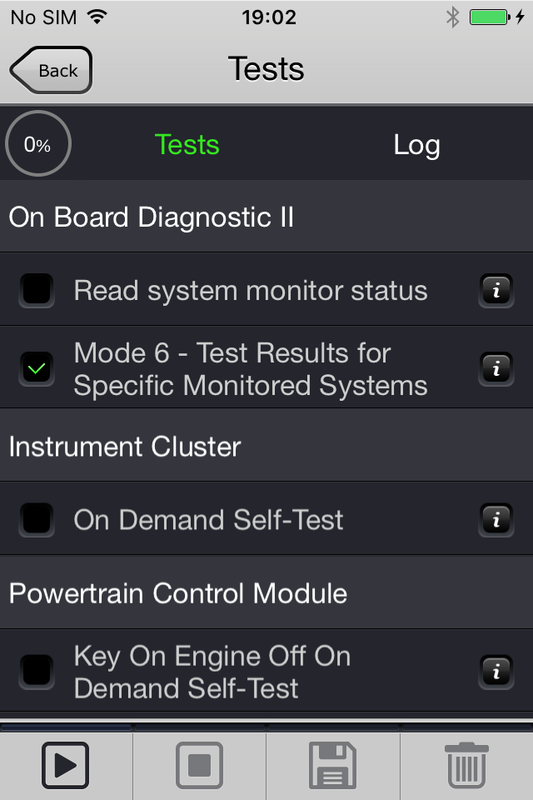 Option Instrumentation forces connect, switch to the Dashboard screen and start reading parameters. Note: any events that require user's feedback (like HS/MS switch) will not be resolved in an automated way but wait for user's attention. MS-CAN support - this setting is used to let FORScan know how to manage MS-CAN modules. By default (Auto) FORScan asks user about HS/MS CAN switch existence. If user set this setting to No, FORScan will not process MS-CAN modules. Otherwise, if HS/MS switch option is set, FORScan will not ask about HS/MS CAN switch availability, but move forward assuming it is available. 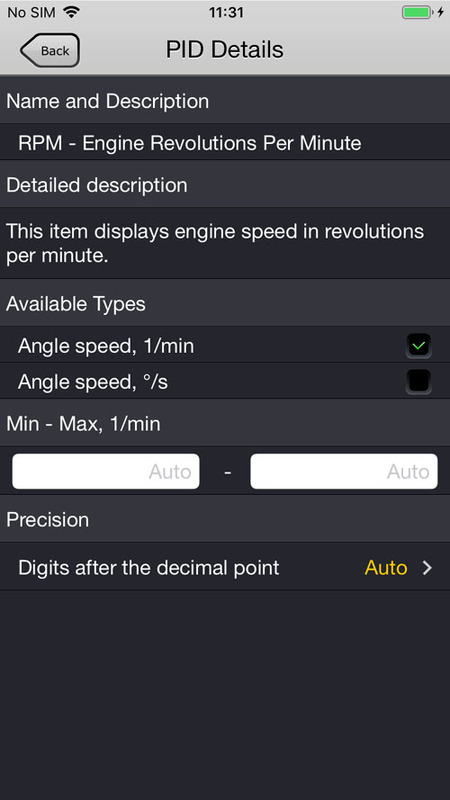 Measurement - using this setting user can choose between metric (default) and imperial measurement systems. Debug mode - this option must be always off except the case when FORScan team asks for debug info. Save button - save content to txt file in application document folder. It can be later extracted from there using standard synchronization procedure in iTunes. Send by email button - this function can be used to send the content as a text file attachment via iOS email client. Unfortunately, when WiFi adapter is used, Internet is usually not available. However, the message can be stored as a draft and sent later, when Internet connection is restored. 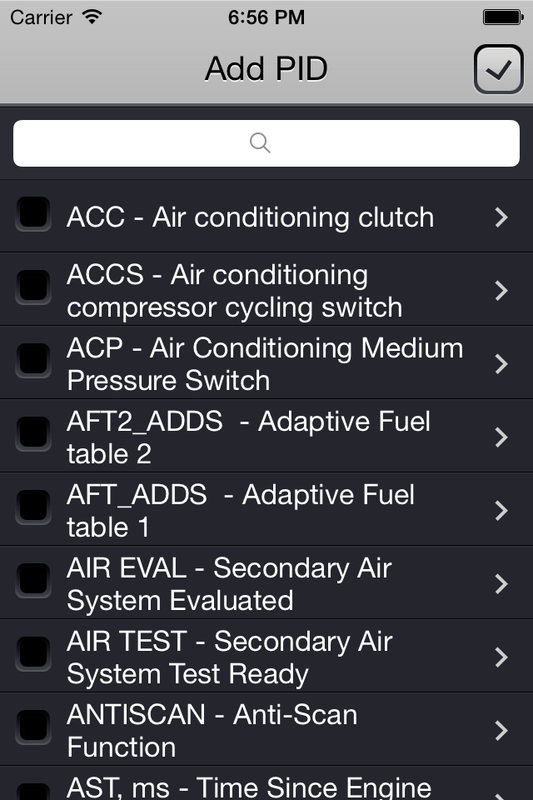 Clear cache button - clears all vehicle caches. 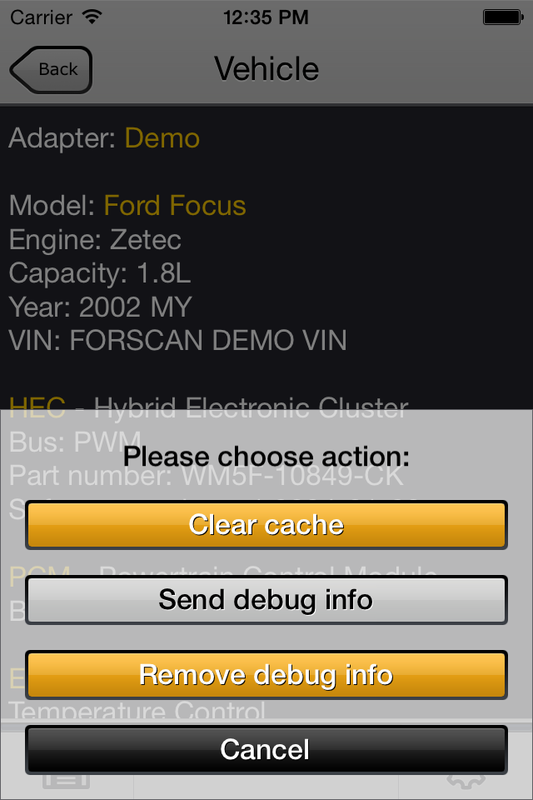 When FORScan Lite is connected to the vehicle first time, it does full scan of vehicle configuration and saves it to the cache. It may take quite significant time, but subsequent connections are established much faster. If the cache is cleared, FORScan has to perform the full scan again. Besides, the cache may contain some info entered by user, such as Min/Max limits for PIDs. This is why the button is marked in orange. In the meantime, PIDs profiles are not a part of cache, so they are not removed when this function is called. Send debug info - this button is used to send internal FORScan debug info. This function should be used only if requested by FORScan Support Team. Important note: by default the debug info is not collected. In order to collect it, the Debug setting in the Settings section must be set. Remove debug info - this button clears all collected internal FORScan debug info. Note: In contrast to Windows version, where the log grows from the top to the bottom (most recent record is always at the bottom), in iPhone version the log grows from the bottom to the top (most recent record is always at the top). This screen contains list of DTCs grouped by modules. 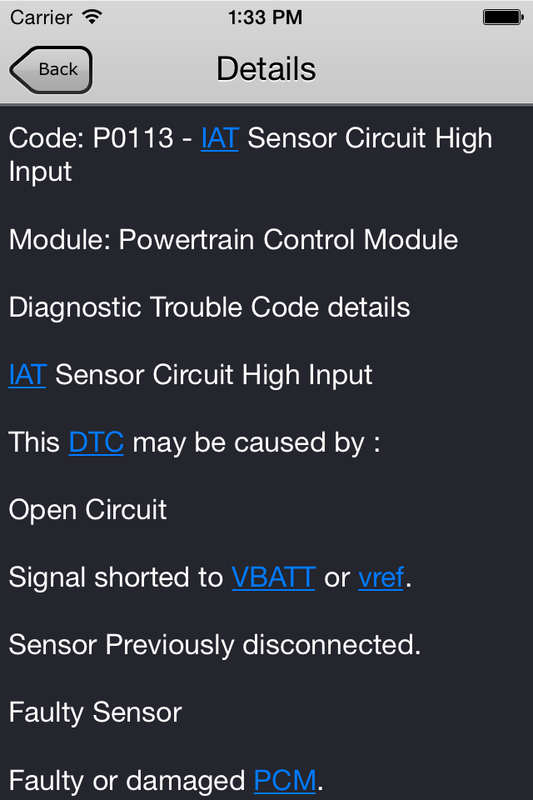 Every group row displays Module name and 2 buttons at the right: Read DTC and Reset DTC. Note that the Read/Reset DTCs buttons are applied to ALL modules. 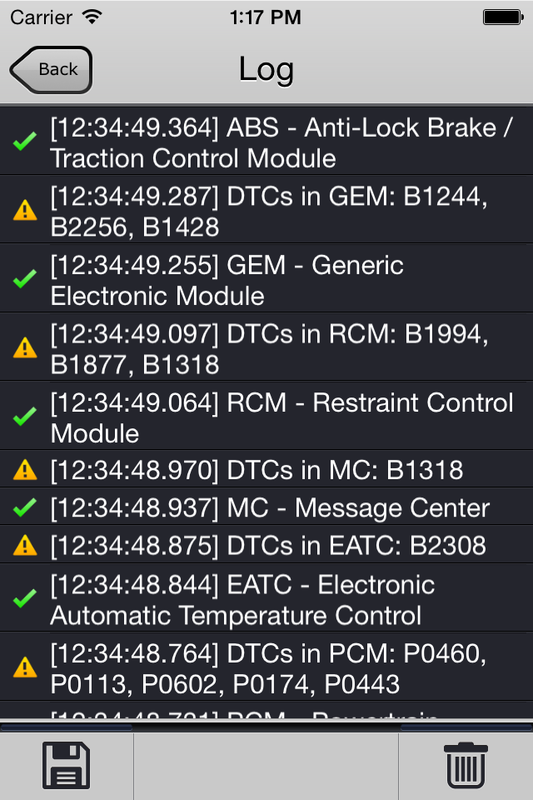 In the meantime the Read/Reset DTCs in every module are applied to this module only. 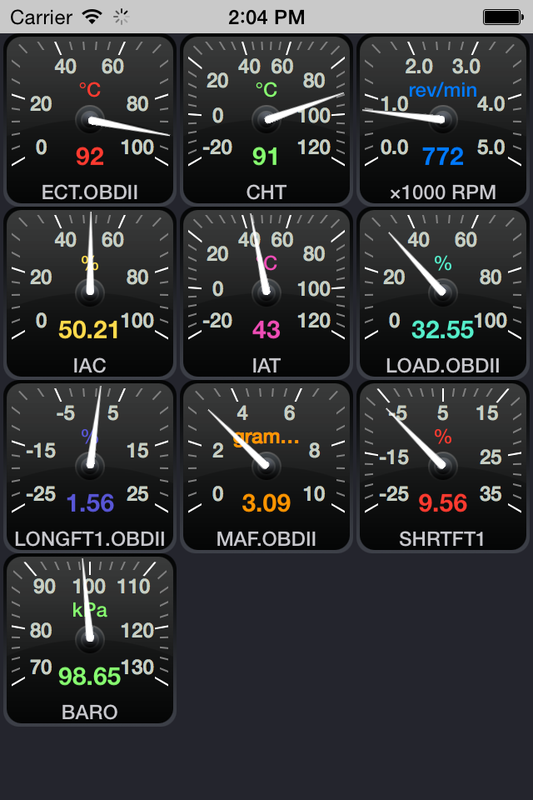 The work area contains gauges, every gauge displays data for a PID. A gauge has a scale and displays PID value in numeric and analog format, also it shows current measurement unit and PID name. Some PIDs cannot be represent in numeric format, so such PIDs have no scale, just PID name and text value. 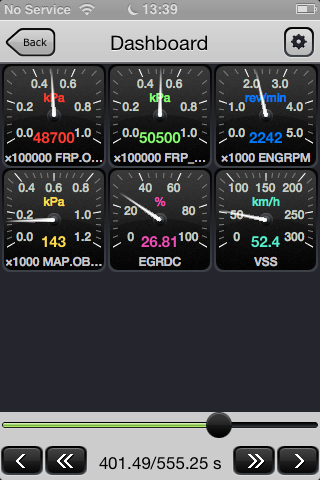 Another feature is that you can select more PIDs that the Dashboard screen can display. You can then scroll up and down to see hidden PIDs. 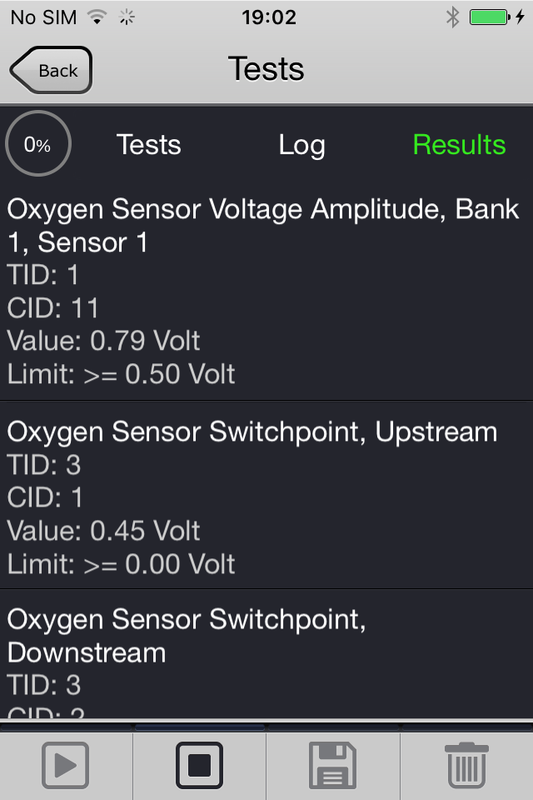 This screen contains information about a parameter, also it can be used to changhe some PID output settings. User can change displayed units and min/max value for numeric PIDs. Min/Max values are used to build gauge scale and graph upper and lower limits. 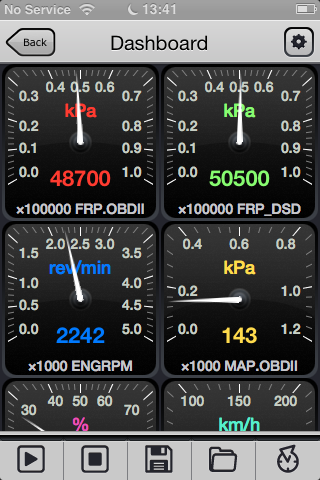 User can also change precision (digits after the decimal point) for every numeric parameter. Hints in the Detailed description are work in the same way as in the DTC detail screen. Open - opens FSL files previously saved to documents. The screen allows to change current module. Every module has its own set of PIDs. So when the module is changed, FORScan Lite loads a list of selected profile owned by the module. 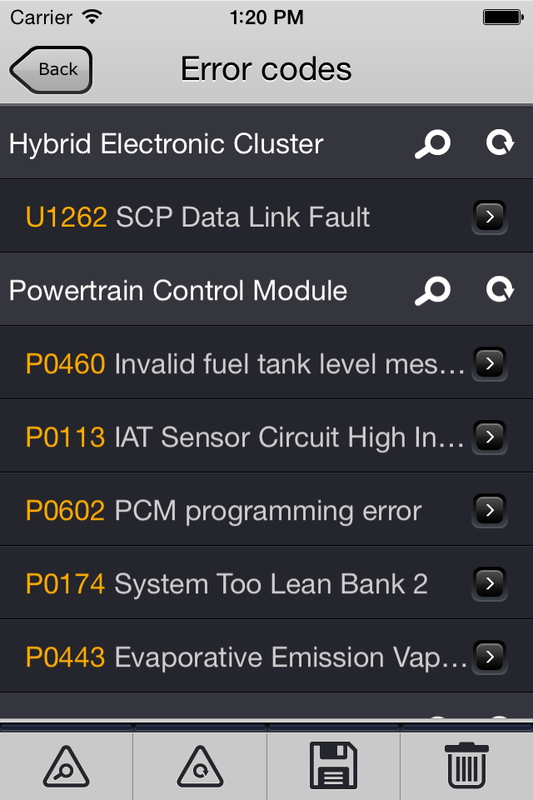 Also, the screen allows to manage list of PIDs - add, remove, edit and sort PIDs. To remove a PID, you should click at the remove button at the left of the row. 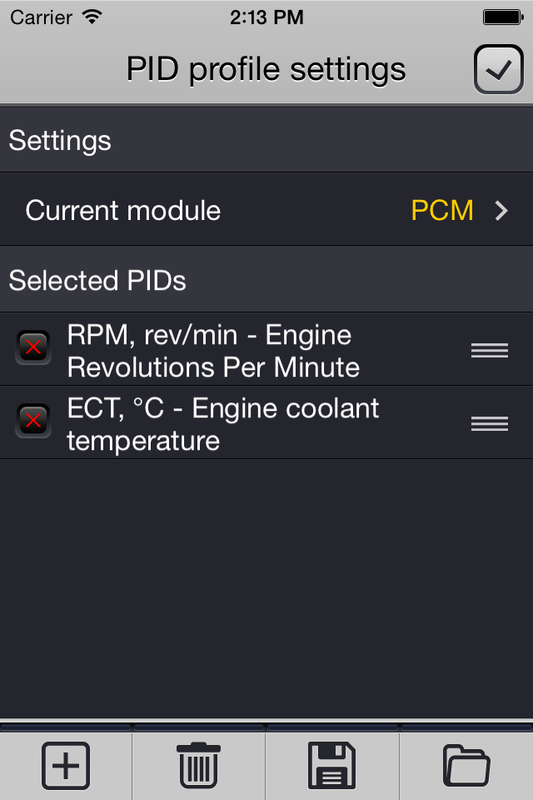 To edit a PID, you should tap on the row - and the PID Detail screen (described earlier) will be displayed. The list can be sorted using standard control in the right side of every row. You should make long tap over the control, then move the selected row to another position. PIDs can be added using Add button from the lower toolbar (described in more details below). 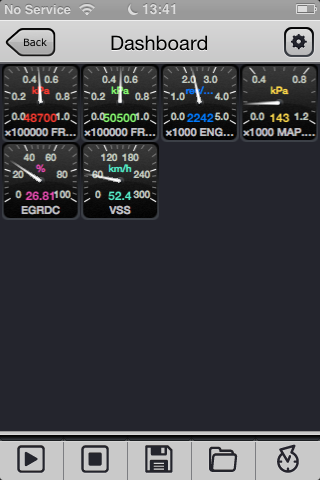 Save - this button allows to save the currently selected PIDs as a PIDs profile. Load - the button allows to load previously saved profiles. It should be counted that profiles from different modules are not compatible. So it is not possible, for example, load profile for PCM module if GEM module is selected. If user needs to display PIDs from several modules, the Aggregated Output feature has to be used. The work area of the screen represents all PIDs available for this module. You can select one or several PIDs by setting checkbox at the left side of every selected row. 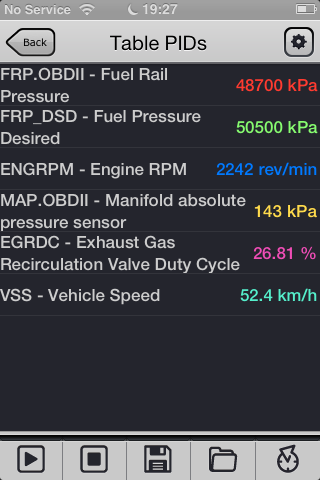 Tap over the row opens the PID Details screen described earlier. The screen has a search bar at the top, you can filter the list using the bar. 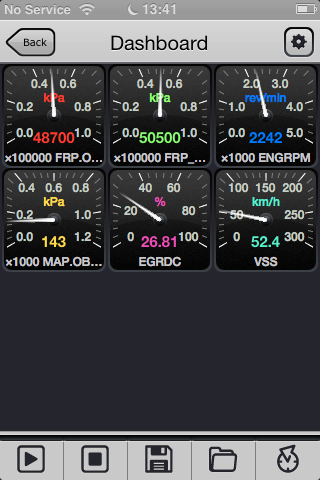 For example, if you type RPM in the search bar, only PIDs that contain RPM in their name or description will be displayed. You should tap over the screen to show the bottom bar that contains stop button. If your press the stop button, the streaming will be stopped and both bars will return back. If you don't press the stop button and tap over the screen again instead, the lower bar will be hidden again. The virtual module All contains all parameters from all real modules. 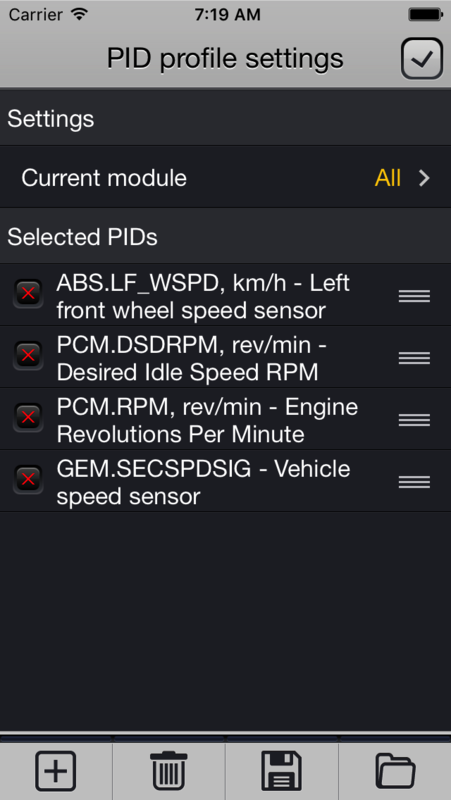 Every PID in the list is displayed with a prefix that points to the original module the parameter is taken from. While adding parameters to the profile, it is recommended to use the search bar at the top of the Add PID screen to simplify the PID search and selection. For example, if user types PCM, all PCM pids will be displayed as they contain PCM prefix in their description. It must be counted that aggregated output has to switch between modules, buses and protocols. As a result, the output performance may drop very noticeable. Also in some cases the aggregated output may be practically useless, for example if user tries to out PIDs from HS and MS CAN modules on adapters with mechanical HS/MS CAN switch. Other functionality of this section is identical to the one described in the Dashboard section. 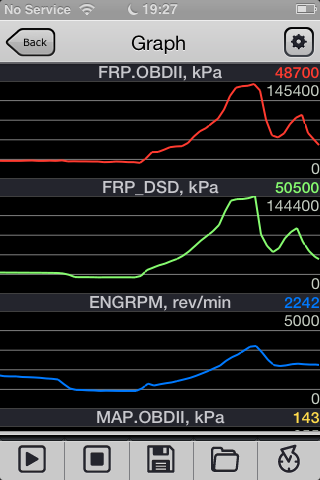 Every graph also displays the current value of PID in numeric format at the top right corner, in the same color. It must be counted that the current value always means the most right visible point of the graph. The tab bar contains at least three elements - a progress indicator that shows a test progress, a Tests tab that contains a list of all available tests, and a Log tab that shows the test log. Other tabs may be added to the pane depending on a test's type, these tabs usually contain results of the test. The application may switch the tabs during the test in an automated mode to provide user with information that is most significant at the moment. Of course, user can also switch between tabs manually. To run a test, user has to select a test by tapping on its line. Checkbox at the left of every line is a choice indicator. Now, when the test is selected, user has to press the Start button to run the test. This sequence of actions should prevent a launch of an occasional or wrong test. 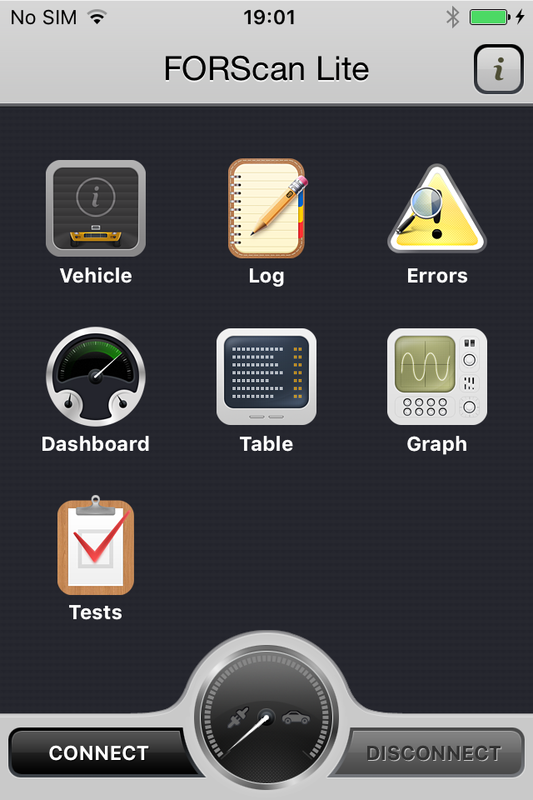 Besides, there is an Information button at the right of every test line. User can get information about test tapping on this button. This information is also displayed when users press start, to provide a chance to cancel the test if wrong one called. Save - calls standard FORScan Save menu to save or send test results and log.